What are My Options for Affordable Engagement Rings? For many couples, an engagement ring is a massive expense. Once upon a time, future grooms were advised to spend three months salary on their beloved’s ring. As the recession hit and pockets tightened, that recommendation became completely outdated. Millennials—who have seen their own budgets tighten from student loans and other costs of living—have embraced rings that are more affordable and that also reflect their individuality and personal style. An engagement ring is an outward symbol of your future as a married duo. The price tag has no bearing on the ring’s meaning or beauty. For couples who see marriage in their future—but who don’t have a lofty budget for a ring—we’re highlighting the beauty of budget-friendly engagement designs. These designs feature large diamonds, smaller diamonds and even colored gemstones as the focal point. The solitaire diamond is one of the most popular styles for engagement rings. The simplicity of this setting is timeless and elegant. Without any extra details or diamonds, the majority of the budget can be used to get the best center stone for your budget. The featured engagement ring highlights an almost half carat round brilliant diamond and is priced at $783. The cost is lower, as the diamond has an “L” grade for color—this is only slightly off-white. 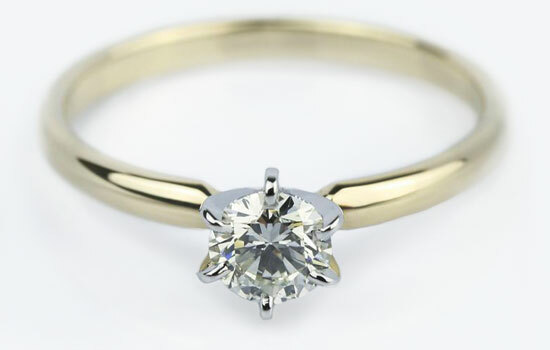 The warmth of the yellow gold allows the diamond to look whiter. Want a larger centerpiece stone? A cathedral solitaire like this can feature a 0.70 carat round brilliant diamond, but still fits the budget at $1,218. Again, the color is graded slightly warmer (an M by the Gemological Institute of America). However, the clarity is perfectly eye clean (SI2…or slightly included under magnification). Choosing less popular diamond shapes—like a heart—also helps make an engagement ring more affordable. For only $1,238, you can get a .75-carat heart cut diamond engagement ring with VS2 clarity. Those who wish for more fire can choose a pave settings. These rings can still fit a tighter budget, but couples may have to select a smaller center stone. This featured engagement ring showcases a quarter carat center princess diamond hugged by a row of pave round diamonds. 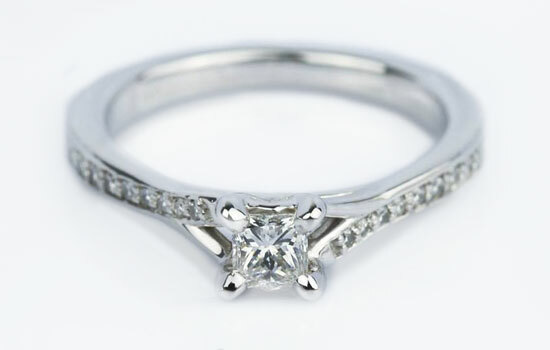 The center stone features an almost colorless grade (G) and a VS1 clarity. And the final cost of the ring is $1,092. Any bride drawn to vintage-inspired rings will love an engagement ring design that features an almost half-carat emerald cut center stone, with a line of white diamonds running along the rose gold band for only $1,179. An engagement ring doesn’t have to feature a diamond as the main center stone. Colored gems and clear fiery Moissanite are gorgeous alternatives to the more pricey diamond. Gemstones can also help you add a personal twist. A birthstone or favorite color makes for a meaningful, but affordable engagement ring. 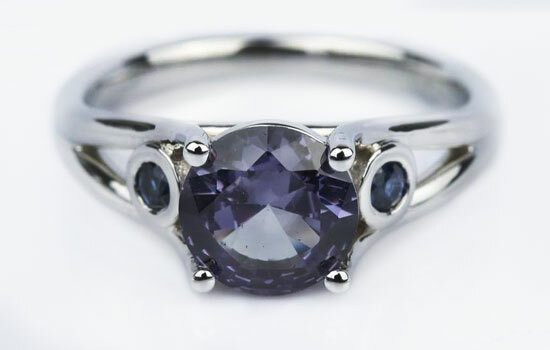 Choosing a colored gemstone, like this Alexandrite shown left, allows for a larger center stone at a lower price. This featured 8.2 millimeter violet-hued Alexandrite is bordered by two tiny dewdrops of sapphires and set in white gold. For the impact of the large center stone, the price is still only $1,095. Moissanite is not a diamond imposter. This gemstone is its own beauty, but it has the clearness and fire of a diamond—for a fraction of the price. A large Moissanite center stone, shown here, is set in a yellow gold band and surrounded by dozens of tiny micro pave diamonds. The cost? Only $1,230. Engagement rings don’t need to break your budget. And they also shouldn’t cost a three-months salary—unless you can afford it. Budget-friendly rings are beautiful and you can get more for your money than you realize. Choose off-white diamonds, gemstone centerpieces or even Moissanite to create a ring that fits your budget with beautiful Brilliance!